Fiore dei Liberi of Premariacco was born sometime around 1350 in Cividale del Friuli, a small town on the river Natisone in the far northeast of modern Italy. His birth year is estimated by the prologue of Il Fior di Battaglia (1409), which says that he had been practicing the art of swordsmanship for more than 40 years at the time of its writing. 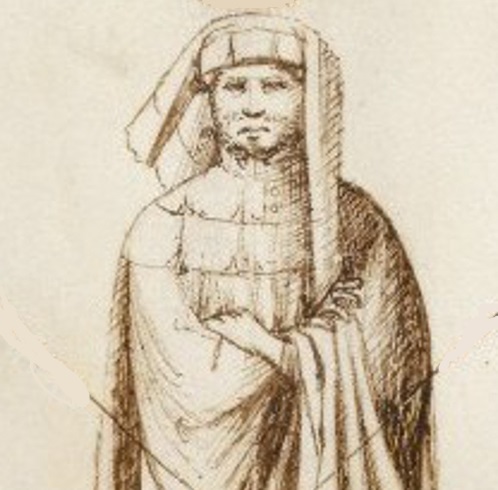 The son of Sir Benedetto dei Liberi, a scion of a minor noble family who had received their ennoblement from the Holy Roman Emperor in the 12th century, and had settled in Premariacco, also in Friuli. Very little is known about dei Liberi’s early life, except for what is written in the prologue of his work. He tells us that he was motivated from childhood to learn the art of wrestling, sword, axe and lance, seeking instruction under a variety of German and Italian masters. Only one of the three manuscripts names any of these masters, specifically, Johannes Suvenus (John of Swabia) “from the Diocese of Metz, a former scholar of Nicolaus von Toblem”. Unfortunately, the biographies of these men are lost to us. At some point dei Liberi made the transition from student to teacher, and began traveling as a weapons-instructor throughout the northern Italian states. Apparently this did not sit well with the local masters, who frowned upon the competition. 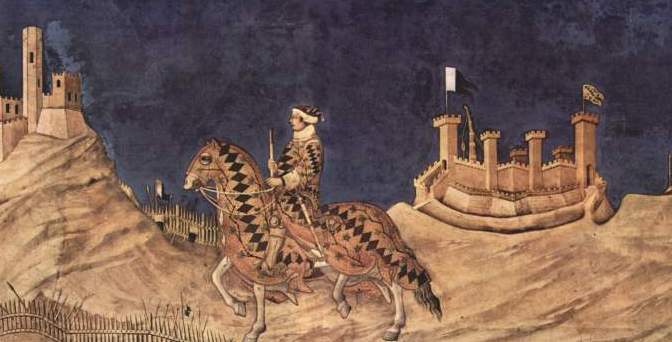 Maestro Fiore also participated in the military engagements that plagued Italy in the last decades of the 14th century. In 1383 he was in Udine, fighting on the side of the town during a civil war. He arrived in the town, perhaps as an independent condottiero (mercenary), and was placed in charge of its ballista crews. Although the details of the fighting that followed are scant, Udine prevailed, and dei Liberi must have played some notable role in its defense; to this day there is street in Udine named for him. Following the defense of Udine, dei Liberi again took to the road as a hired sword and swordmaster. While the details of his life in this period are lost, the names of the students he trained, and the feats of arms they performed, are not. Although their ranks and pedigrees varied widely, all were condottieri. 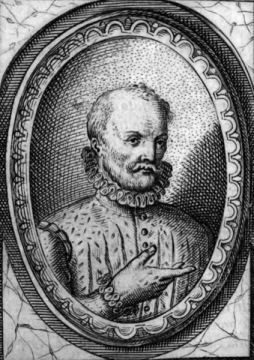 The most notable was the short, but powerfully built Sir Galeazzo da Mantova, Captain of Grimello. He was a cadet of the famed Gonzaga family of Mantua who fought in service of both Milan and Venice, becoming captain-general of the Venetian armies in 1405. Galeazzo gained fame by crossing spears with the renowned Marshal Boucicault of France on two occasions. The first of these feats of arms was fought on foot with lances, and is specifically mentioned in dei Liberi’s prologue. It occurred in Padua in 1395, before the lord of Padua, Francesco Novello di Carrara, and Galeazzo’s kinsman, Francesco Gonzaga, the lord of Mantua. The two lords intervened during the combat and the antagonists were placated. The old adversaries would meet again eleven years later, this time with lances from horseback, and Galeazzo was declared the victor. Out of shame, Boucicault took a vow never to wear a helmet again. Dei Liberi can next be traced to Pavia in 1399 and from there is believed to have entered the court of his last, and greatest patron, the young, bellicose Niccolò III d’Este, Marquise of Ferrara (1383-1441). It was at Niccolò’s request that Fiore wrote his manuscript. In 1409 Fiore dedicated his treatise to the marquise, and after 1410 there are no records of his life or death. It is unknown precisely when he died. Our knowledge of Filippo Vadi is limited to little more than a few records, a book of verse and the sketchy biography he produces at the beginning of De Arte Gladiatoria Dimicandi. A native of Pisa who studied medicine at the University of Ferrara and dabbled in poetry, Vadi claims to have learned the art of swordmanship “from many masters in various and different countries.” In truth, he may have needed go no further than Ferrara itself, where dei Liberi had taught before him, and multiple copies of his book were kept in the d’Este library. Vadi dedicated and presented a beautifully illustrated handbook on the use of arms to Guidobaldo da Montefeltro, shortly after the latter’s ascension to the ducal throne of Urbino in 1482. We cannot even be certain that Vadi was ever in the Duke’s service, for while his treatise is dedicated to the ten year old Duke, nothing in those dedicatory verses make it clear that he was a member of the court. Nevertheless, he has been linked to the court by fencing historians ever since, and the considerable cost of producing a painted book suggests the sort of patronage the martial and artistic culture of Urbino would have supplied. Dardi was an astronomer and mathematician at the university of Bologna, and founder of the “Bolognese School”. Details of his life are largely lost, and obscured by the sometimes casual “research” of later fencing historians. He was said to have lived and opened a sala d’armi (training hall) in the parish of Santa Cristina di Porta Stiera, which various sources date to 1413, 1415, or 1443. Dardi wrote a now-lost treatise on the relationship between fencing and geometry and is said to have died in 1464. A first or second-generation disciple of Dardi, di Luca was arguably the greatest master of the tradition. He lived in the parish of Santa Maria delle Muratelle, and while he left no written treatises, the fame of his students has survived the centuries. Amongst the most famous were the condottieri Conte Guido Rangoni and the famed Giovanni de Medici (aka Giovanni dalle Bande Nere), and the fencing masters Achille Marozzo and Antonio Manciolino, of whom the former wrote, “from whose school came more warriors than from the belly of the Trojan Horse.” Di Luca is said to have died in the early 16th century. Almost nothing is known of this master, Marozzo’s contemporary, besides his Bolognese origin, and his work, Opera Nova, which was printed in two editions; the second, from 1531, survives. The quality of Manciolino’s writing, and his classical literary references, points to a well-educated man; while tradition lists him as a student of di Luca and a “condiscipelo” (classmate) of Marozzo. Certainly, the two masters share a very close technical repertoire, although while Marozzo’s work, also called Opera Nova, is a much larger work, Manciolino’s is the more clearly organized and explained. 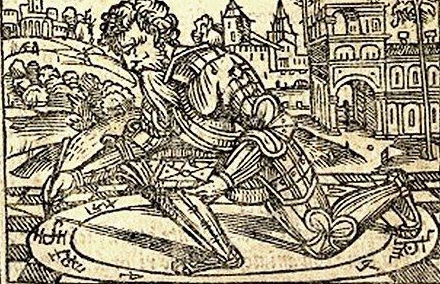 The most famed member of the tradition to modern fencing historians, Marozzo was born in 1484 and died in 1553. He maintained a sala d’arme near the Abbey of Saints Naborre and Felice in Bologna, and wrote his own massive fencing treatise, also entitled Opera Nova, in 1536. The book was published multiple times in many cities – Modena (1536), Bologna (1546), Venice (1550). It was revised and republished by his son, Sebastiano in Venice under the title Arte dell Armi in 1568. Marozzo’s teachings remained so popular that an edition appeared in 1615, long after the rise of the rapier. Born in 1517 and died c.1555. A Venetian innovator whose work actually preceded Camillo Agrippa’s by three years, he instructed his brother to wait at least fifteen years after his death before publishing work, entitled Lo Schermo (“Fencing”). It was printed in Venice in 1575 and in Bologna in 1588. In his treatise, Viggiani simplified the tradition, reducing the number of guards to seven and introducing a less metaphorical nomenclature. Viggiani presented a basic framework of the inter-relation of guards, blows and parries, explicitly defined through Aristotelian physics, and including one of the first detailed discussions of tempo. He boasted that in a half-hour lesson he could teach a student enough to survive a duel. This lesson consisted of the seven guards and their relationship to the blows, a universal parry, the rovescio ascendente, (first found in dei Liberi), combined with a universal attack, the punta sopramano (an overhand lunge). Born in 1547, his date of death is unknown. Dall’Agocchie is the last documented master of the old Bolognese school, who published, Dell’arte di Scrimia in 1572. His treatise maintained the old nomenclature and guards of the tradition, but in keeping with the increased focus on civilian combat limited its focus to the sword used alone and with the dagger. Shields, polearms and the spadone were ignored altogether, although the last section of the book did discuss using the lance from horseback. For modern students, dall’Agocchie’s greatest virtue is a detailed explanation of the guards named, but not defined, by Marozzo, and his section on “how to win a duel in 30 days”, which, like Viggiani, presents a fencing primer, but moves beyond the universal parry and overhand thrust. Born in Padua, Italy, in 1544, Salvatore Fabris became one of the most famed, and influential fencing masters of his day, and produced one of the most complete, if not the most complete, treatises on Italian rapier fencing. 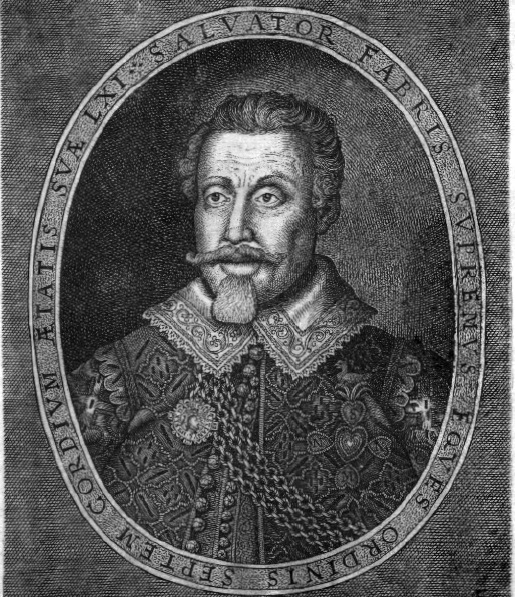 His skill as both swordsman and teacher, brought him both fame, and fortune as the master to many influential, and wealthy patrons, from Johan Frederik (Duke) of Schleswig-Holstein-Gottorp and Archbishop of Bremen, to his final patron, King Christian IV of Denmark, whose service he entered in 1601, as the royal fencing instructor. During employment at the King’s court, Fabris was made Supreme Knight of the Order of the Seven Hearts, a testament to his prestige and regard at court. It was also under Christian’s patronage that he wrote and published his opus, the enormous rapier treatise Lo Schermo, overo Scienza d’Arme (1606), with Jan Halbeeck, the court painter, as his artist. Fabris’ book is somewhat unique, both for its plain language, and its breadth of detail. In Book I, Fabris laid out the technical, tactical and mechanical foundation of his art, with the sword alone, and combined with both cloak and dagger. This is in a similar, though somewhat more detailed, vein to the work of his contemporary, Giganti, and later masters, such as Alfieri and Marcelli. But Book II is unique amongst the entire corpus of rapier manuals —a series of advanced techniques and tactics building upon the lessons learned with each weapon combination in Book I. Lo Schermo became a sensation, translated into multiple languages, and continually republished until 1713. Shortly after the publication of his book, Fabris informed King Christian that he wished to return home to his native Padua, to finish out his days. He returned to Padua, amidst some pomp, and remained there until his death by fever on November 11, 1618 at the age of 74. Hailed by other masters as “a man of the greatest name in our profession,” he was accorded a princely funeral and a monument was erected in his honor. Yet his fame continued beyond death, especially in Northern Europe, writing the foreword to a bi-lingual 1677 edition, Johann Joachim Hynitzsch, himself a student of a master trained directly under Fabris himself, said that the “Salvatoran Art” had been spread to Denmark, France, Germany and Poland by a number of masters, most notably the famed Kreuselers, a fencing dynasty who taught at the university of Jena, until well after Fabris’ fame faded as the age of the rapier came to a close in the early eighteenth century.